As the partner of the prestigious event, Porsche for the first time ensured that the players were driven to the Kensington Roof Gardens venue. First on court, Sharapova will face Errani for a place in the final and they will be followed by Ivanovic and Jankovic in the other last four match. Watched by a capacity 4400 crowd, Maria Sharapova eventually closed out the match after three hours 23 minutes against the battling Lucie Safarova. 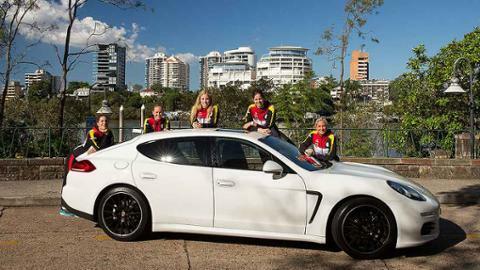 The whole seven-woman Porsche Team Germany will be appearing in Stuttgart. Porsche Team Germany has clinched a place in the Fed Cup final. Angelique Kerber secured the decisive point in the semifinal against Samantha Stosur. What a start: Andrea Petkovic and Angelique Kerber both won their singles on the first day of the Fed Cup semifinal. Andrea Petkovic will open for Porsche Team Germany in the Fed Cup semifinal against Australia.